When I was in London I found myself entranced by something I normally don’t tend to spend a lot of money on – notebooks. I have been carrying around my trusty Moleskines faithfully for years, they are black and unobtrusive and do their job well enough. I knew of Smythson of Bond Street and its aspirationally priced range of leather goods and stationery of course, but I had never actually taken note (yes, bad pun, I know!). I managed to pass by the Bond Street flagship store twice without caving, but when repeatedly confronted by their concessions at Harrods and Selfridges I could no longer resist. The time was right for me to explore their offerings in-depth. 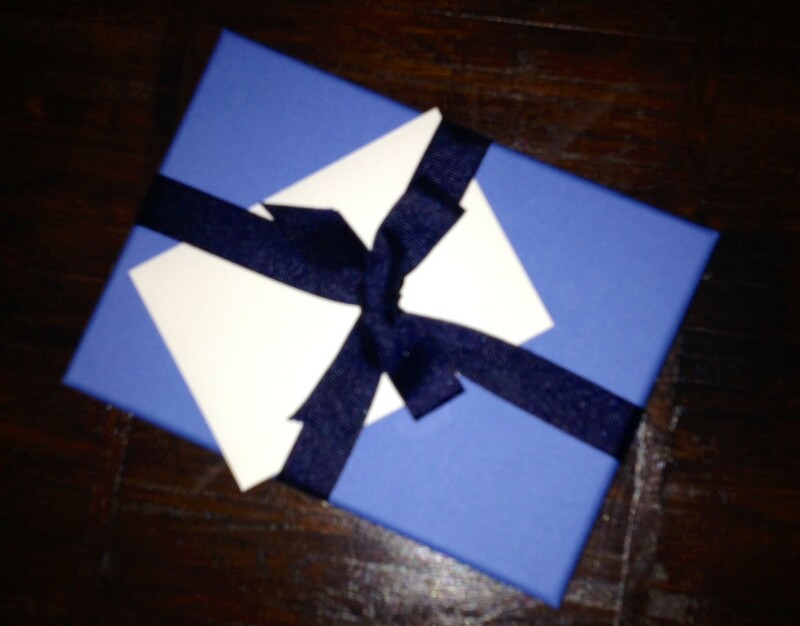 I brought home with me this gorgeous nile-blue package containing a nifty diary for those of us who find they don’t want to go on with their lives Smythson-free in the middle of the year. This diary starts in Mid-May (on the 19th to be exact and as that is my birthday, I had no choice but to take it as a sign) and runs until July of the next year. 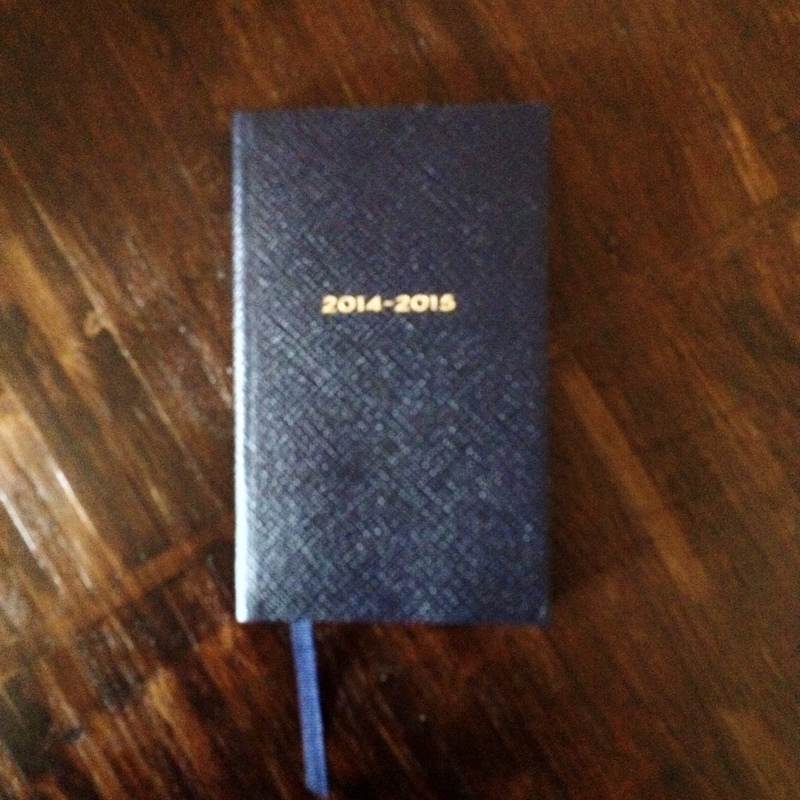 So all my dire diary needs are taken care of until the middle of 2015. 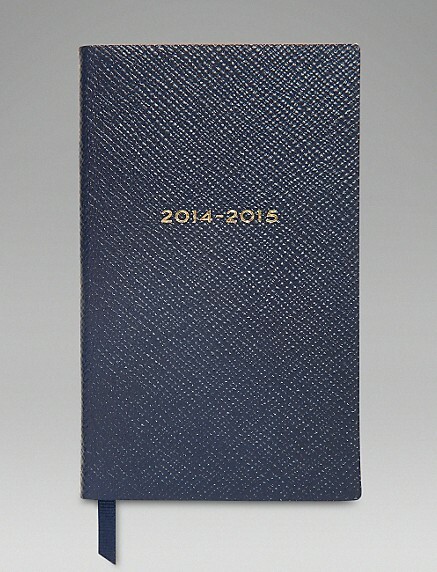 The diary is covered in navy-coloured lambskin, the pages are gilt-edged and made from very thin, lightblue paper called “feather-weight” that is fountain pen proof and watermarked. In short: one could say it screams luxury, but I find it rather whispers class and elegance. In addition to the diary I just had to pick up a companion to hold my notes for blogging, writing my book and life in general. 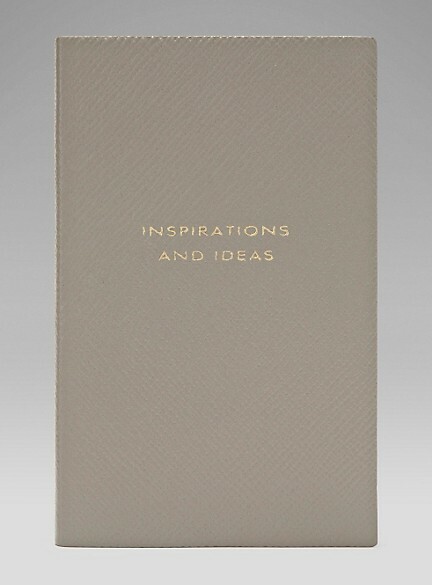 This notebook is a warm grey colour, features lined pages in the same Smythson signature paper as the diary and has an inner back pocket to fit cards or whatnot. Smythson paper is fabulous to write on if you are using a fountain pen, which I do. I find a fountian pen writes so much nicer than any ballpoint pen or pencil and my handwriting is much improved when I write with the easy flow of ink rather than dragging a ballpoint pen across the pages. The notebooks and diaries are available in a plethora of colours and sizes and yes, they are not cheap. At all. Hopefully there will be no accusatory discussion about money, because it is everyones business how and what to spend their money on. We don’t need any of the little luxuries that make life pretty of course. But need is not the point here. If you are looking for something that makes writing feel like a pleasure, something that makes mundane things like organizing your life special, Smythson will surely make you happy. Just looking at those two small books makes me smile, handling them is a sensory pleasure and writing in them feels just plain great. I try to look to beauty everywhere in my life. I want to be surrounded by beautiful and functional things. If I have to have something anyway, it might as well be pretty too. Take a look at the Smythson of Bond Street website here. What do you use to write? Are you like me drawn to good old pen to paper action or is it digital all the way for you? What is your take on functionality vs. beauty? This entry was posted in Travels and tagged fountain pen, London, notebook, Review, Smythson, Writing, writing by hand. Bookmark the permalink. Gorgeous! I am checking out their website today… oh no! I love all types of art material and stationary and I totally understand the pleasure you get from using a new notebook or diary. I didn’t know thatsmythsons do a mid year one, which I think is a brilliant idea. I have given up on the fountain pens though, I much prefer funky ball pens and even ordinary pencils, may be because I’m left handed and always struggled a bit with them. Glad you share my love for paper, Sabine! I’ve been a fan for a long time and I fall for something every time I go into their shop. Handbag, calendars, notebooks and this last time (Vanilla meet-up…) a heart shaped key ring of orange leather. 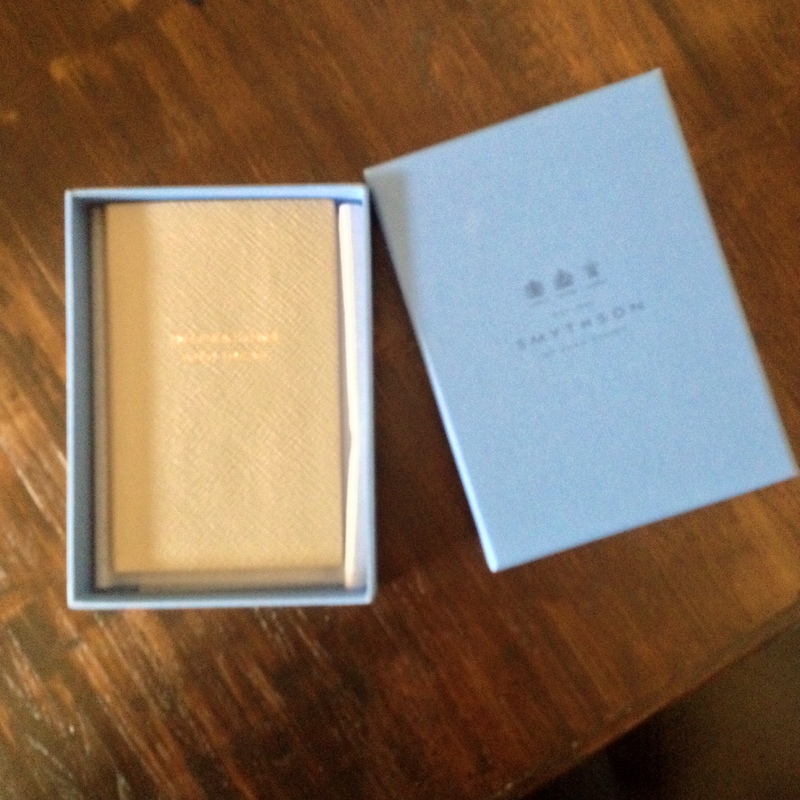 I totally share your opinion about Smythson : they are ab fab ! Ha! That is so very nice to know! 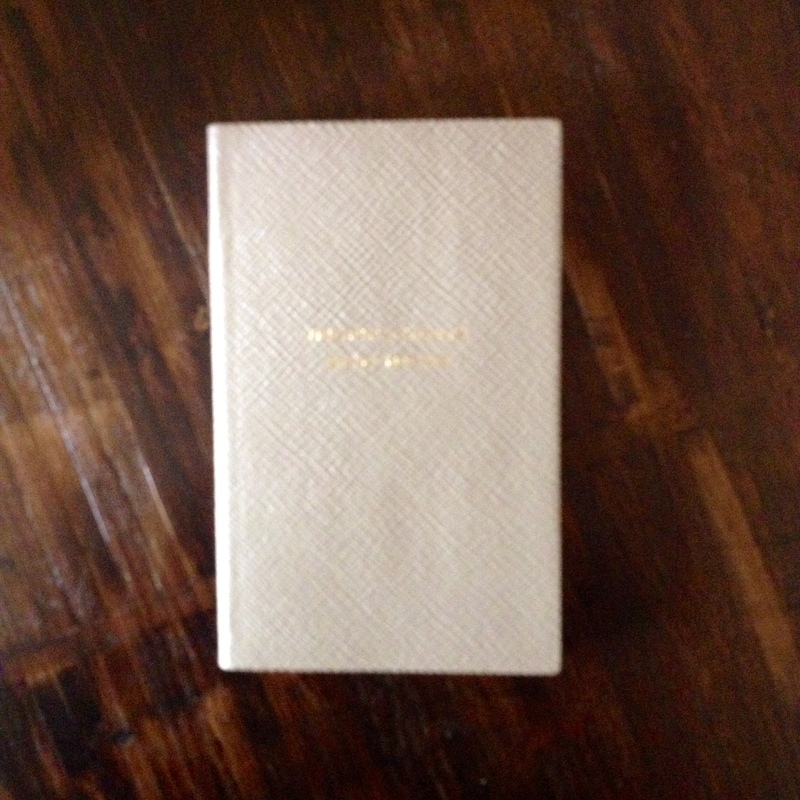 So haply you are a fellow Smythson fan, dearest LJG! I have enough addictions. I love you Birgit but you can not tempt me. But you make it sound SO GOOD! Just gorgeous! It was a treat just to to look at the pics and salivate over your descriptions. I totally agree that having lovely notebooks and pens makes writing more of a pleasure and improves your handwriting too. I’m sure the notebook will inspire you no end and what’s the chances of finding a diary that starts on your birthday?! You couldn’t leave that behind. What nice reminders of London too. The grey one is an exact match to my wallet though, and I’m stupid like that, perfect matches make me happy. Glad you enjoyed this non-perfume post, Tara. I love good stationery, and while I am not in the market for anything quite as top drawer as Smythson, I totally understand its allure. As Tara said, I would have had a hard time choosing my favourite colour for each book, but grey is always a good bet. My recent luxury stationery coup was finding a box of Orla Kiely paper and envelopes for £5! Congratulations on your stationery coup, V! It must be in the air – I was just blogging about snail mail and fountain/cartridge pens! Write on! I will check out your post asap. Nice purchases, Birgit. Many years ago, I bought a fountain pen with different colored ink cartridges, as well as some beautiful small notebooks, but I found that I actually wrote less than when I just used a ballpoint pen and a very plain notebook of the variety one uses for school. For some reason, I find small notebooks difficult if they don’t lie flat and don’t have lined paper, and I never mastered getting the fountain pen to print well – kept getting blots on the page. My husband also made me some journals, and I filled one up but left the other half empty, basically for the same reasons. Easier for me to use a plain notebook, but I do love stationery stores and seeing fine writing tools. Have fun with yours! I love paper and pens, too – I suppose this is a safe space to confess that I’m a stationery hoarder. If I find something I really like, I buy about six boxes, since I’m convinced, often quite rightly, that it will soon go away and I’ll never find it again. But what I’d really like to know is what kind of fountain pen you (all) use, as I do love fountain pens. I use a Montblanc 149 fine for grading, with lovely reddish-purple ink, and I have an Omas arco green celluloid and Pelikan 400 green striped as well, with B and BB nibs. Wow, what fabulous pens you have! Also very happy to hear you are a stationery fan too. I, very unspectacularly, use a Lamy Al-Star pen with a 1,1mm nib that I’m quite happy with. Thanks – I have been collecting for 30+ years, so one good pen per decade. I hear wonderful things about Lamy on the fountain pen enablers (sorry, boards) that I follow. Could you please tell me what blogs/forums you are following in the pen/paper community? I would love your recommendation on what is worth reading! 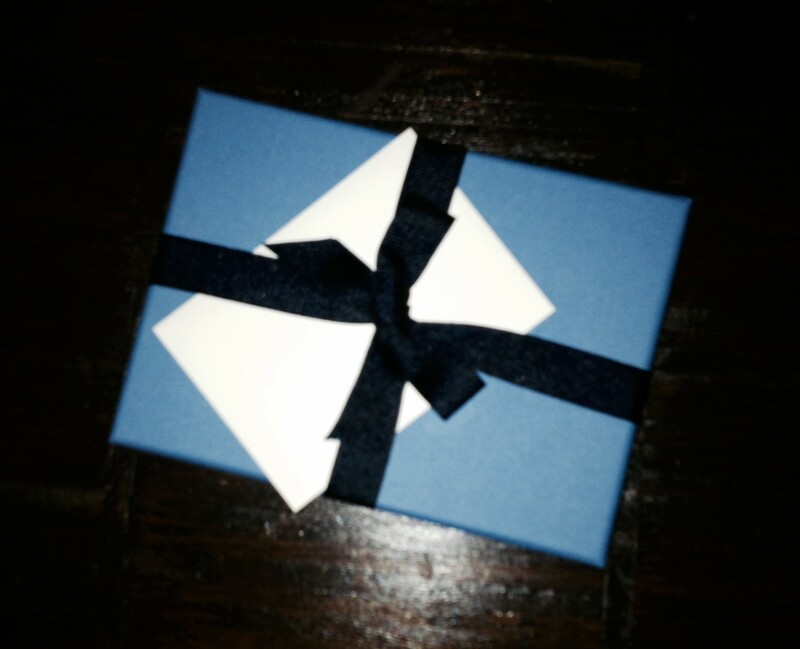 Congrats on your purchases! It does make sense to buy beautiful things that can actually be used on a daily basis (which is one of the things I enjoy about perfume). Good-quality stationery is something I really like also. For notebooks & diaries I use moleskine even though the whole marketing spiel irritates me; my journals though have to be unlined, hard-backed, and minimum A5 size. I love the linen-bound ones from the Swedish company Bookbinders Design (the colours are to-die for) but plain Rodial notebooks look and feel very good too. Do you know the German company Leuchtturm 1917? They make fantastic notebooks in many colours, sizes and fantastic paper. 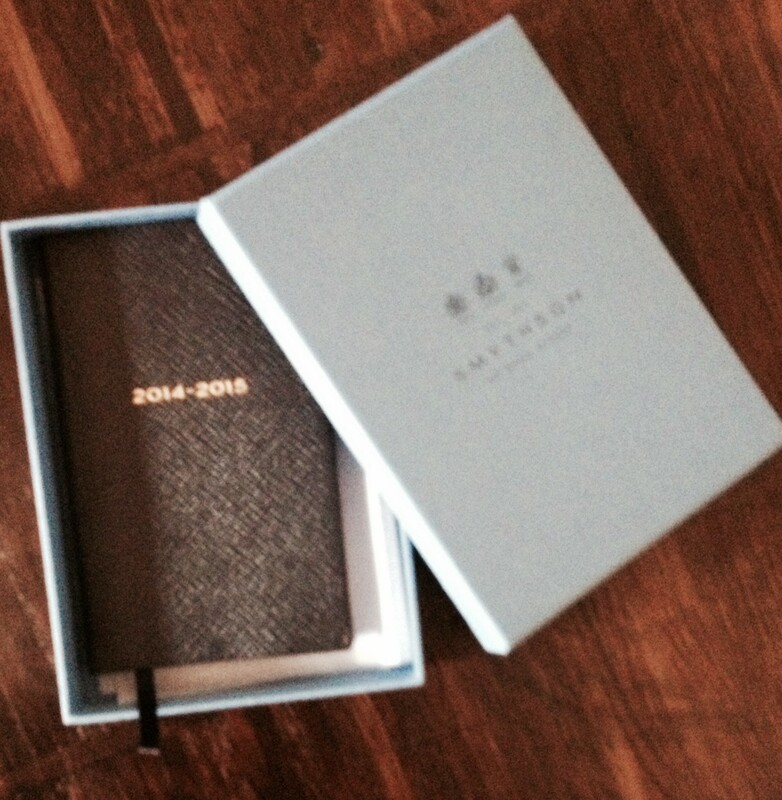 Bokkbinders Design have excellent notebooks and traditional photo albums. I used to buy them as gifts for friends, but the company closed their shop here in Oslo so the products are no longer equally easily available to me. I would be interested in tips on good stationery in about A4 size, since I still love to write letters (SMS, phone calls and mail supplements the letters these days). I will look up Bookbinder Design, thanks. As for the paper, I use Bütten paper (by Huber&Lerner) as my really “good” stationery, for regular letters I like to use Clairfontaine as it is very good with ink. Thanks for the tip, I will look into it and perhaps ask friends or my stepmother’s family to get me some from Vienna. I just love to use good quality paper, but it does not have to come in a fancy box, I look at the texture of the paper itself. Several local brands disappeared over the last 10 to 15 years, so need to find new favourites. Just seen that Leuchturm 1917 have arrived over here now! Their range looks very comprehensive and nicely made. Not sure about the Neon yellow one, but there’s a good choice of colours. ;). Thanks for the tip off. Sorry, Leuchtturm. No lighthouse without that other ‘t’! You are welcome. They are indeed very well made, sturdy and pretty. The paper is of much better quality than Moleskine imho. I love the look and feel of really nice paper 🙂 It is easy on the eye and wonderfully textured and weighted as well (It’s practically like having a puppy, really). I have not made the jump to fountain pens yet, but perhaps that will be my birthday gift to myself next year! I’m so happy that so many readers love paper too! Do try writing with a fountain pen, there is nothing better!